Motherwell suffered a deserved 3-1 defeat at Rugby Park despite Curtis Main opening the scoring. We were outgunned for most of the match and were fortunate not to lose by a bigger margin. We paid the price for failure to capitalise on an early goal together with a penalty miss that could have given us a two goal lead. Kilmarnock were a changed team after the MacDonald saved the 22 minute penalty and dominated the game thereafter. We started with just the one change from the midweek defeat at Tynecastle with Taylor-Sinclair given his first league start since the opening day of the season. Campbell moved to the bench. Killmarnock kicked off (two attempts needed) facing the away stand with ‘Well in the claret away kit. Our first sniff of a chance arrived when Bowman’s deflected cross floated in the air with Grimshaw eagerly awaiting the fall. Burke nipped in to clear before our man could get his shot away. But we did get a shot away a few minutes later. Bowman sent his fellow striker on a chase and despite close attention Main was able to drill low into MacDonald’s right hand corner. Main had a a chance from the penalty spot to score his second following O’Donnell’s foul on Taylor-Sinclair but MacDonald got down well to save. The home side took heart from their escape and piled into attack. 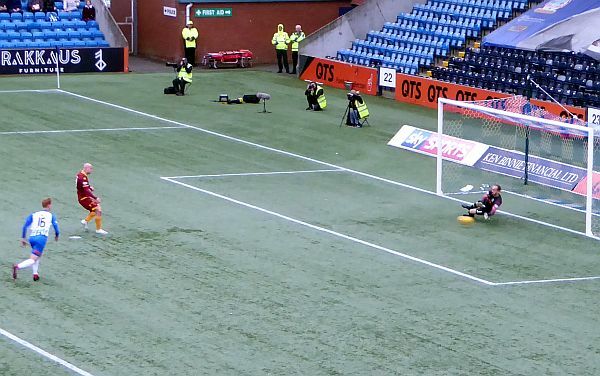 Tait had to clear off the line as Broadfoot’s header threatened. The home side got their reward in 39 minutes when Carson was forced to parry a Jones shot from the left only to give Burke an easy finish at the far post. We managed to concede another before the break when less than impressive defending gave Stewart the chance to score. Carson let Bigirimana know of his displeasure. It promised to be an unhappy half-time team talk. We endured a bit of an onslaught after the break. Kilmarnock had us pinned back and unable to find any route up the park. We cracked around the hour when Donnelly fouled Stewart and Brophy made no mistake from the spot as he sent Carson the wrong way. Turnbull and Johnson replaced Tait and Bigirimana in an attempt to salvage something from the shambles. Our opponents wer by far more composed and competent. They carried a bigger threat with every forward move while our rare adventures to MacDonald’s goal saw little action. We survived a ruckus in our six yard box when it seemed like a fourth loss was likely but survived leaving Tshibola needing treatment. There was relief when O’Donnell pulled a shot wide but the game continued to be played in our box as our hosts took pot shots. Carson produced several fine stops to spare further blushes. It could have been much worse.